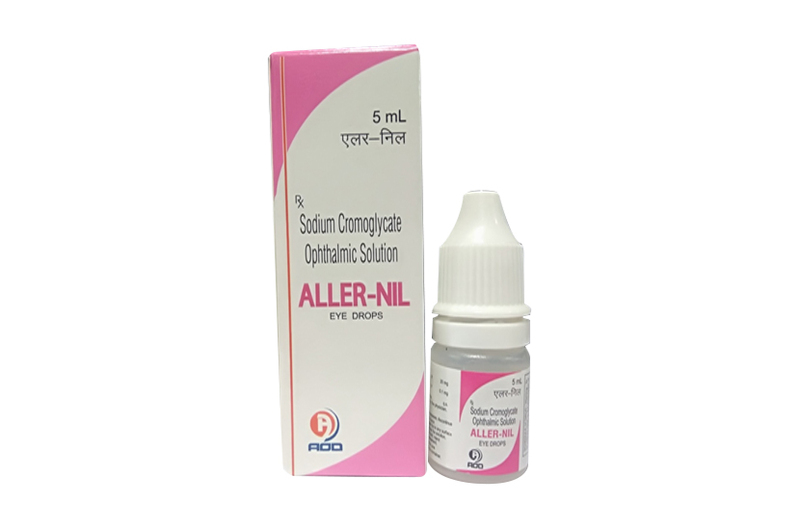 Allernil- Eye Drops (Cromolyn Sodium Ophthalmic Solution) is an anti-inflammatory medication used to treat allergysymptoms that affect the eyes, such as itching, burning, watering, swelling, redness, or sensitivity to light. Opticrom is available in generic form. Common side effects of Opticrom include burning or stinging of the eye after you use the eye drops, dry or irritated eyes, puffy eyes, or watery eyes. Cromolyn sodium has no intrinsic vasoconstrictor, antihistaminic or anti-inflammatory activity. Cromolyn sodium is poorly absorbed. When multiple doses of cromolyn sodium ophthalmic solution are instilled into normal rabbit eyes, less than 0.07% of the administered dose of cromolyn sodium is absorbed into the systemic circulation (presumably by way of the eye, nasal passages, buccal cavity and gastrointestinal tract). Trace amounts (less than 0.01%) of the cromolyn sodium dose penetrate into the aqueous humor and clearance from this chamber is virtually complete within 24 hours after treatment is stopped. Allernil- Eye Drops (Cromolyn Sodium Ophthalmic Solution) is is indicated in the treatment of vernal keratoconjunctivitis, vernal conjunctivitis, and vernal keratitis. Allernil- Eye Drops (Cromolyn Sodium Ophthalmic Solution) is contraindicated in those patients who have shown hypersensitivity to cromolyn sodium or to any of the other ingredients. Allernil- Eye Drops (Cromolyn Sodium Ophthalmic Solution) is for topical use only and not for injection or oral use. The dose is 1 or 2 drops in each eye 4 to 6 times a day at regular intervals. One drop contains approximately 1.6 mg cromolyn sodium. Patients should be advised that the effect of cromolyn sodium ophthalmic solution therapy is dependent upon its administration at regular intervals, as directed. If required, corticosteroids may be used concomitantly with Allernil- Eye Drops (Cromolyn Sodium Ophthalmic Solution). Allernil- Eye Drops is supplied in one clear polethylene Bottle packed with printed labelled & cartons And Such 25 Carton Packed in a Shrink Sleeves & corrugated box.